John Gravett of Lakeland Photographic Holidays shares his tips on shooting glass. 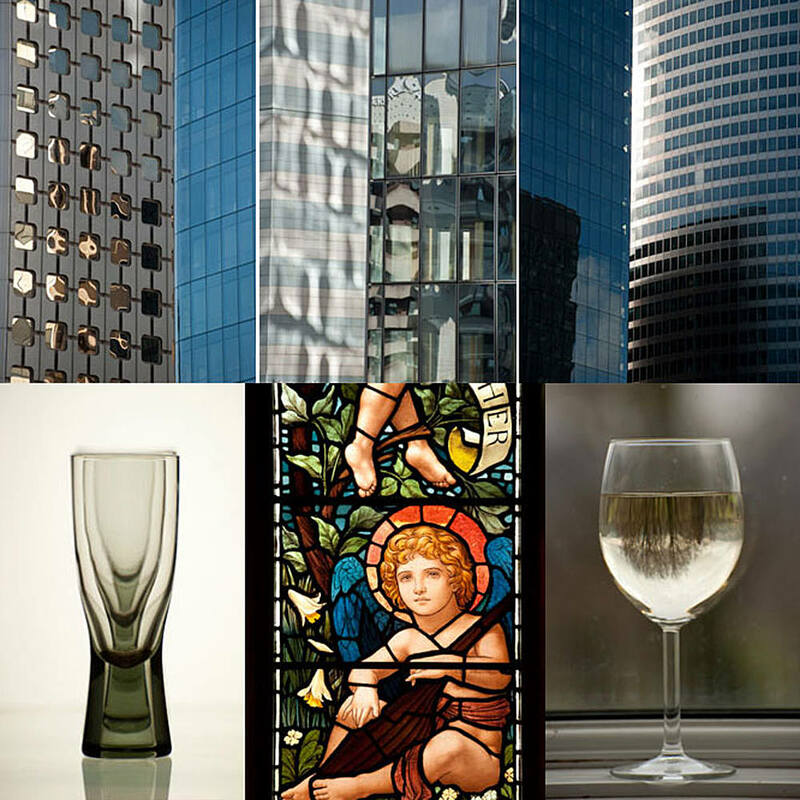 Glass – we look through it, or drink out of it everyday, but rarely look upon it as a subject for photography. The equipment you need will vary as much as the subject you're shooting, but usually a long lens (and tripod) are good for the best results. With glass as a subject, there are many ways to shoot or light it. I took a wine glass full of white wine, and simply put it on a window sill, the inverted image of some trees outside the window lifted the simple composition and made the glass more interesting. To photograph glass indoors, it always looks best lit through the glass, I stood a lightbox on its side and placed a glass sheet in front of it – I actually used an old fish tank, this allowed the glasses to be lit from below and behind all with the same light source, to bring out the shape by highlighting the edges of the glasses. A good way of really emphasising the edges is by bringing dark panels in at the sides, which reflect and emphasise the shape still further. Whether we photograph from the inside of the building through the glass, or from the outside, capturing reflections, shooting glass is often about simplifying. Stained glass windows in churches make a great subject, but people often fall into a couple of easy mistakes. Firstly they try to get all the window, including all the surrounding stonework in, and secondly, they stand too close. Trying to get too much in the shot typically results in too much small detail, failing to bring across the real detail within the window. The surrounding area of dark stone usually records no detail, and by affecting the meter reading also causes blown-out highlights in the window. Standing near the window and pointing the lens up to get the whole window in creates converging verticals which need too much adjustment later in Photoshop. I try to find the element, pattern or scene in the window that I find appealing, and by using a long lens, from as far back in the church as I can get, point the camera up as little as possible. These techniques make metering easier (although if the window has a few clear areas, you might need to use -1/3rd stop compensation to avoid losing detail in those); and will minimise converging verticals. I have used up to a 400mm lens at the far end of a church for window details. If it is important for you to keep detail in the surrounding stonework, you may find it necessary to bracket exposures and combine them using HDR software for the best results. With stained glass, the weather makes a big difference too; a sunny day with the sun streaming in the window is about as bad as it gets – the best time for stained glass is on an overcast day, when the shadows of the protective mesh that is so often fitted outside does not show. If the sun is shining through the window, try shooting the abstract patterns of light that the sun creates. Windows in modern office blocks can reflect the most amazing reflections and abstract patterns. Again, it's not necessary to get the whole building in the shot, in fact, it often works well when juxtaposing two adjacent buildings of slightly different styles. Try a longish lens to help isolate detail, a 70–200mm would be ideal. Another technique for glass could be shooting through a window on a rainy day, when the raindrops create a pattern in their own right. As an added dimension, try to get something appropriate through the window, as it can give a feeling of what you'd like to be doing if it wasn't raining. Glass in all its forms can clearly make for an interesting and varied subject, with no real limitations – so get out and give it a go. Words and images by John Gravett of Lakeland Photographic Holidays.